The saying goes, March: in like a lion, out like a lamb. For us allergy victims it's the opposite! I've started my spring cleaning which means lots of sneezing, itching, headache, and hard breathing. To top off my self-induced allergy attack I think my daughter is showing signs of the darn things too! Anyhoo, in my quest to reduce allergy triggers I've switched our cleaning products to all natural products which have helped amazingly. Today I'm washing all our curtains which are major harborers of ick. 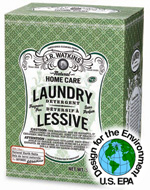 I'm using Watkins Laundry Detergent which I LOVE! It super cleans everything and does not leave residue that tickles the nose and scratches the skin of us lucky allergy & asthma sufferers! WATKINS LAUNDRY DETERGENT is very economical, cleans great, no additives, rinses clean in one cycle and leaves no residues or strong perfume smells because there's no irritating dyes and fillers. When phosphates end up in lakes and rivers (usually as runoff), they promote rapid and unnatural plant and algae growth, killing off other aquatic life. Excessive algae growth can jeopardize the life cycle of rivers, lakes and streams. Sending them on an accelerated path to someday becoming dry land. By not using phosphates in our products, we are helping to keep waterways in a healthy balance. It ís perfectly safe for septic tanks. I've never heard of it but, it sounds like really awesome detergent!